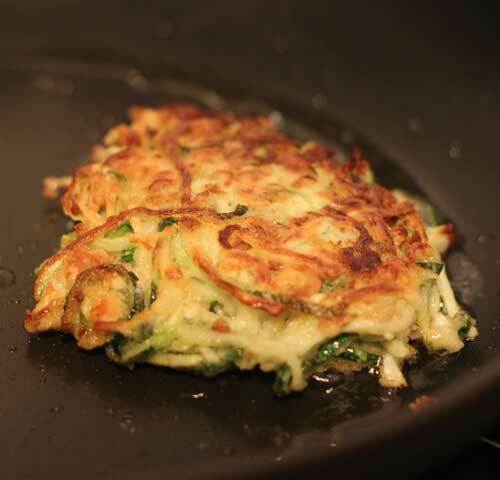 Alchemy in the Kitchen: 'Courgetti' Fritters with Lemon and Feta - Watch them vanish! 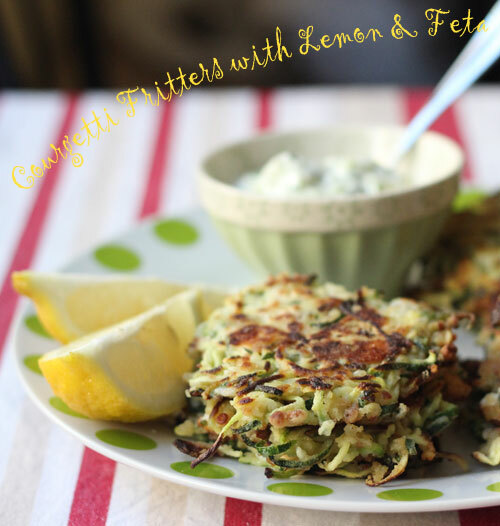 'Courgetti' Fritters with Lemon and Feta - Watch them vanish! Courgettes are like magic beans. You set off for the market. On the way you get conned into handing over your cow for a few small seeds. You return home delighted with your "bargain", but your mum chucks them out the window in disgust and practically at once they spring forth from the ground and start growing like beanstalks almost before your very eyes! Once they flower, they magically produce courgette after courgette - seemly overnight - and suddenly you have the equivalent of a courgette factory and the need for 101 courgette recipes. One of my favourite ways to eat this vegetable to is spiralize it into 'courgetti' and then tip these delicious veggie noodles into whatever pasta sauce that is heating on the stove, give them about 3 minutes to heat through, then serve. Courgetti also make a delicious salad, tossed in soy vinaigrette and toasted sesame seeds. They are also great stir-fried with garlic, ginger and chillies. Another is the ‘Some Like it Hot’ Courgette Vichyssoise from the book – a lovely light summery soup and a doddle to make. My latest favourite, though, is Courgetti Fritters with Feta and Lemon. They can be a snack, a starter, an unusual side - and a delicious way to make courgettes vanish as quickly as they appeared. 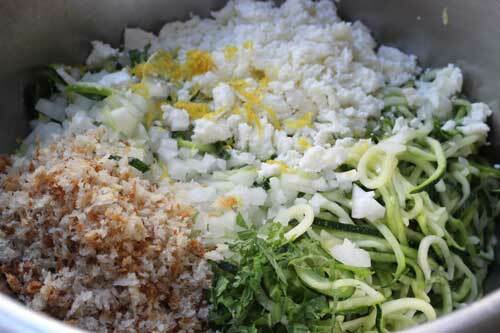 Start by spiralizing the courgettes (skin and all) using the fine noodle attachment of your spiralizer*. Using a scissors, cut them into lengths about 6cm – about 3 inches - long, otherwise they’ll end up being an unmanageable tangle. Put them in a colander over a bowl and sprinkle with the teaspoon of salt. 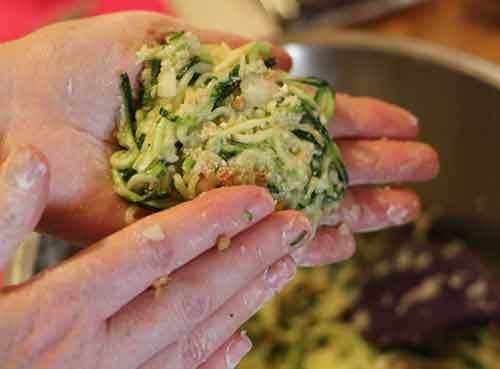 (*If you don't have a spiralizer, coarsely grate the courgettes instead). Squeeze the courgettes to remove as much liquid as possible and drain this away. Place the courgettes in a clean tea towel and wring out as much liquid as possible. Place in a bowl with the rest of the ingredients except the flour and mix until well combined. Divide the mixture into 8 – 10 portions. Using floured hands, form them into flat little cakes, about 1cm thick. Place on a lightly floured plate while you heat a little of the oil in a non-stick frying pan over a medium heat. Cook the fritters for about 3 -4 minutes each side, or until golden brown and serve hot. Simple! I love them as a snack with either the crisp apple (or cool as a cucumber) Tzaziki in the Starters, Snacks and Light Bites section of the book. Sigh...my zucchini plant doesn't do well...all male flowers. 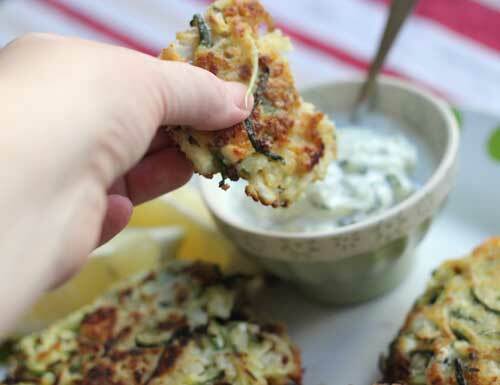 These zucchini fritters look so delicious! My neighbor has gigantic zucchini in her garden (didn't plant a garden myself this year), that she's more than happy to share so I can make your fritters in abundance!